Bottles can melt when they are unintentionally exposed to high enough temperatures to do the trick. Very hot campfires and building fires can generate the temperatures needed. Recently however, beer bottles are being intentionally melted (called slumping) and sold as spoon rests and cheese trays. The high temperatures needed for melting these bottles are typically created in a kiln. Scrape the labels from the bottle. Make sure to also scrape away any glue residue. If the bottle label is etched into the glass, leave it alone because it will remain intact through the melting process and make the melted bottle more unique. Coat the bottom of the kiln, or the kiln shelf, with glass separator to prevent the glass from sticking to those surfaces. Apply three coats, allowing each coat to dry before applying another. Wait for the final coat of glass separator to dry completely. Place a bottle on its side on the kiln bottom, or on the kiln shelf. When placing it on the kiln bottom, be sure it is not touching the sides and that it isn’t touching any heating elements (the coiled wires that surround the inside of the kiln). Set the kiln to raise its internal temperature no more than 500 degrees F per hour. For a kiln that has a thumb wheel and a limit timer, the limit timer might be set to 3 and thumb wheel set to 4. Kilns have different control mechanisms, so check the manufacturer's instructions for the kiln you are using. When using a kiln sitter, you will also need to place a small 013 firing cone under the actuating rod and on top of the cone supports inside the kiln. Start the kiln according to the kiln manufacturer's instructions. Hold the temperature at 1,100 degrees F for 10 minutes by propping the lid open slightly. Slow the temperature increase to 250 degrees an hour by regulating it through raising and lowering the lid periodically, or by resetting the thumb wheel to a lower value. Once the temperature reaches 1,300 degrees F, it can be increased at any rate desired up to 1,425 degrees F.
Check on the progress at 1,400 degrees F by looking through a peep hole, or opening the lid slightly. Maintain the temperature between 1,400 and 1,450 degrees F by opening and closing the lid until the bottle has reached the desired shape. Open the lid slightly and allow the kiln temperature to drop to 1,100 degrees F.
Turn the kiln off following the manufacturer's instructions. Allow the kiln to cool with the lid closed. Once the kiln temperature is under 90 degrees, it is safe to remove the melted bottle. 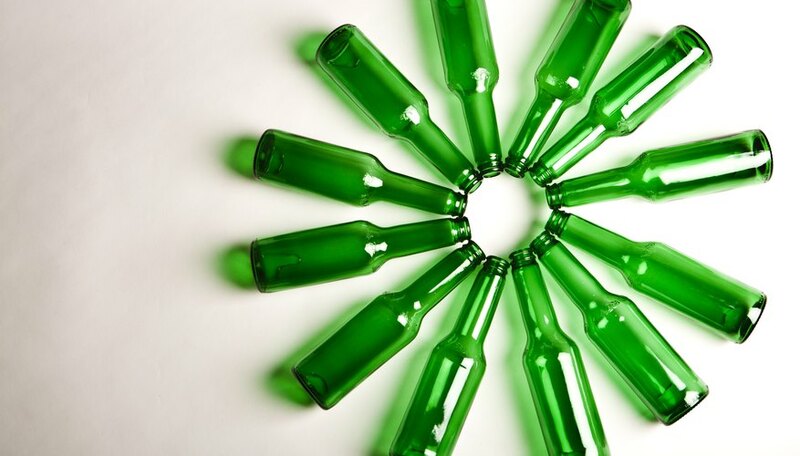 Since not all beer bottles are made to the same specifications, it may be necessary to experiment to find the best temperature for the bottles you are melting. In small kilns it will be necessary to use the bottom of the kiln, while in larger ones a kiln shelf will be large enough to accommodate the entire length of the bottle. Recoat the kiln bottom, or kiln shelf, with glass separator after every three firings. Do not leave kiln unattended while firing. Follow kiln manufacturer instructions closely.